GAF's Gaffe: Minister Orders Investigation. 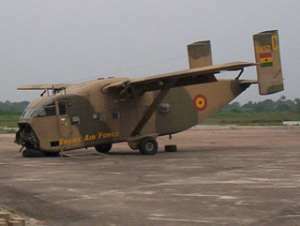 Accra, April 11, GNA - The Ministry of Defence has said the office of the Minister for Defence, was not privy to the transaction in which four Skyvan Aircrafts were sold to Messrs Pink Aviation Services (Document). A statement issued by the Ministry of Defence and signed by Colonel E. W. K. Nibo, Director of Public Relations said "Consequently, the Minister has directed that thorough investigations be conducted into the whole matter." It said the attention of the Ministry of Defence had been drawn to an Accra daily publication on April 5, 2004 titled "Scandal rocks sale of GAF Aircraft," in which four Skyvan Aircrafts were declared unserviceable and sold as scrap to Messrs Pink Aviation Services at 42,000 dollars. The statement said the revaluation exercise, which was carried out subsequently arrived at an auction price of 240,000 dollars. It said the Ghana Armed Forces High Command had detected that "the procedure for evaluation, auction and disposal action were not properly adhere to. As such the disposal action was stopped." The statement said, Messrs Pink Aviation Services was invited for renegotiation of the contract price "in the light of the new development."